I’ve got a star in the garden right now, and it’s Mirabilis jalapa, otherwise known as Four O’Clocks (or ‘Marvel of Peru’). These cheerful flowers hailing from tropical South America start to open every day at - you guessed it - 4 pm, just when a lot of other flowers are looking a little peaked in the heat of the day. They stay open all night and close before the sun reaches its zenith. A lot has been written on the way these flowers smell - and I must say, I haven’t noticed it. But then I’m usually asleep by 10, so I’m not out taking nighttime strolls in the garden. The scent of these flowers, and the fact that they are mostly nocturnal, should tell you something about the insects who like to visit them. Four O’Clocks are pollinated mainly by hawk and sphinx moths (family Sphingidae). These are mainly found in the tropics, but also can be found in more temperate regions, especially somewhere like warm Walnut Creek. I’ve only ever seen one of these moths and it was years ago, so it might be a good idea to set up a night camera and see if I can capture them at work. In the daytime, I often see hummingbirds on these flowers, but almost never bees. 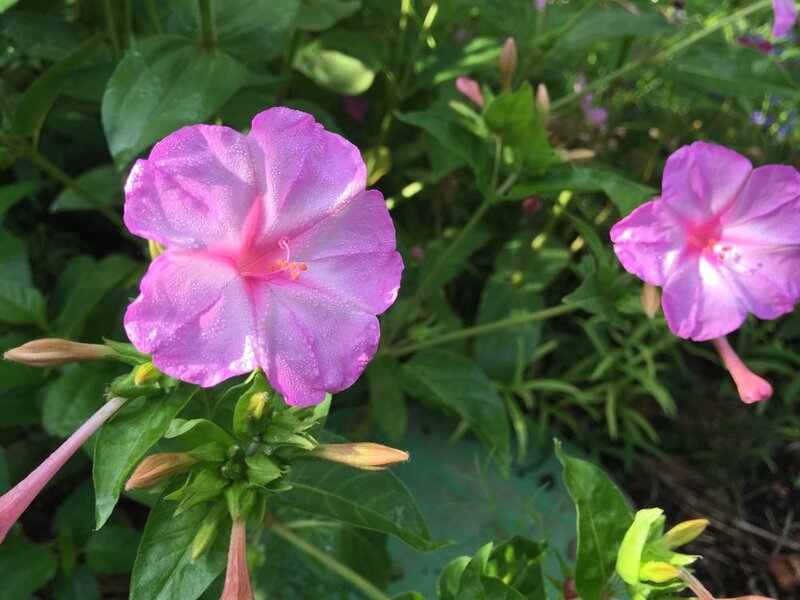 Four O’Clocks are easy to start from seed. I just ordered them from Renee’s Garden and scattered them in the pollinator beds. It takes them a year or two to get ‘stuck in,’ and from then on, you’ll have a lovely display that will grow each year, as these produce a ton of seed. They also grow via tuberous roots that can be invasive, so you’ll want to watch them. The roots can survive very cold temperatures, as well, and reliably bloom again in the summer. The seeds are big and look like mini grenades. This plant is apparently toxic, so don’t eat it. It survives long stretches without any irrigation, and does prefer a lot of sun, but I have them in places that are getting regular irrigation and half-day sun, and they look great. So it seems to me that they are easily adaptable. At this point, all my different patches are sort of cross-pollinating and I’m getting some interesting mixes of colors, which is a hallmark of this flower. It’s fun to see what will come up next!